There is no better way to ‘reccie’ a potential new swim then to actually go there and scout it out. Entry points, exit points, flow, water condition, hazards etc can only really be determined by actually being there. However, that said, there are some brilliant online mapping tools that allow you to check out possible locations all from the comfort of your own home and at least get a good idea of what to expect before you get there. The ‘Birds Eye View’ on Bing.com maps. 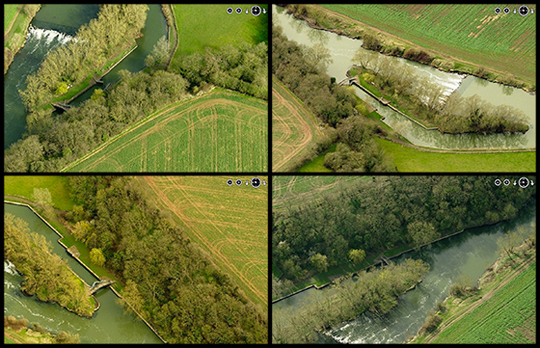 The Bird’s-eye view on Bing.com displays aerial imagery captured from low-flying aircraft. Unlike the top-down aerial view captured by satellite, Bird’s-eye images are taken at an oblique, 45-degree angle, which give the user better depth perception for buildings and geography. These images are typically much more detailed than the aerial views taken from directly above and with the oblique view you can get a much better idea of the topography. This can be extremely useful when scouting for entry/exit points, especially as some obstacles on a swim can be difficult to get to when not actually traveling along the river. For example the lock below on the River Avon was very hard to see from Google’s satellite view but using the four cardinal views one could get a very good idea of the possible portage points. Google satellite view is also useful, but if you compare the results from it’s ‘straight down’ view to those above you can begin to see why Bing’s is superior for determining entry/exit points. However a nice feature is Google Maps street view. Most people only think of it as applicable to roads but it also tracks GPS tagged photos which means you can often find existing images of possible swimming locations. 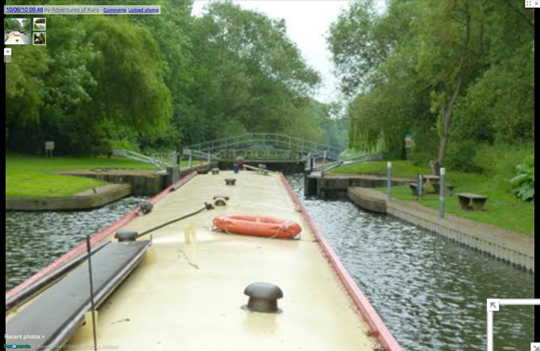 Google Maps has also announced plans on rowing down some 2,000 miles of the U.K.’s canal systems to capture imagery that it hopes will promote local and tourist interest in visiting the towpaths. You can read more information on that here. The other great tool is mapmyrun.com. From a reccie point of view it is good to know how far you will be swimming. Originally designed as a tool for runners to plot and share their favourite runs it was quickly hijacked by swimmers. 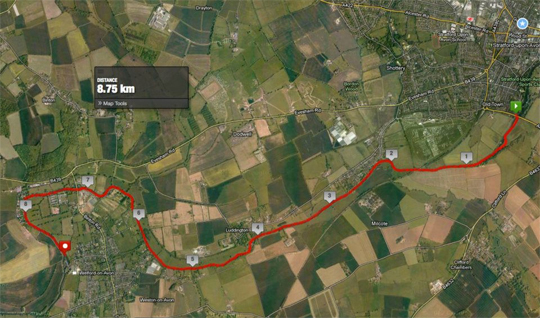 I think mapmyrun.com has recognised this as it has now began to include ‘swimming’ categories in the map descriptions. 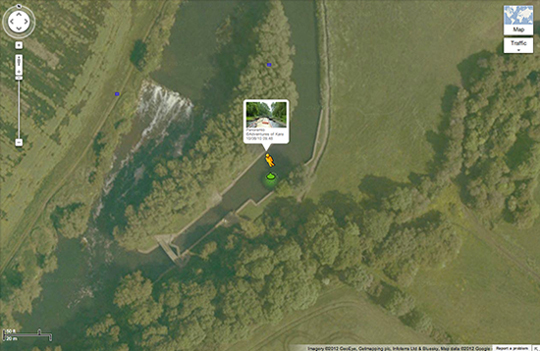 For river swims it is ideal as with the satellite view switched on you can easily follow the course of the river to plot out your swim. I am sure there are lots of other online tools out there that would be useful for planning open water and wild swims so if anyone has come across them then I would love to hear about them. As mentioned at the start of this post, there is no better way to safely reccie a swim location then to actually go there and walk/kayak the location first. One other thing to remember is that all the online mapping tools in the world will not show you everything. 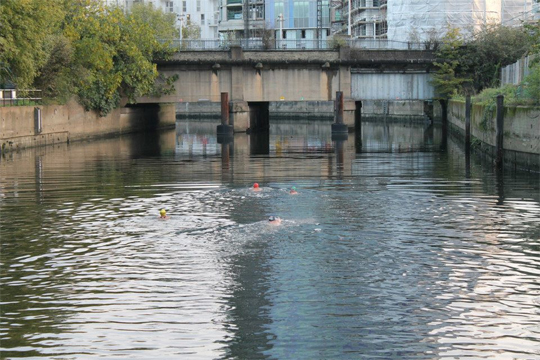 Once when I was keen to do a guerilla swim in the Lea Waterworks Canal I had looked online for ages at possible entry/exit locations but it was not until I had been there in person and discovered a ladder under a road bridge that we had any chance of doing that swim. This entry was posted in Fun Stuff, Swimming and tagged Online Maps, Urban Swimming, Wild Swimming. Bookmark the permalink. Post a comment or leave a trackback: Trackback URL.